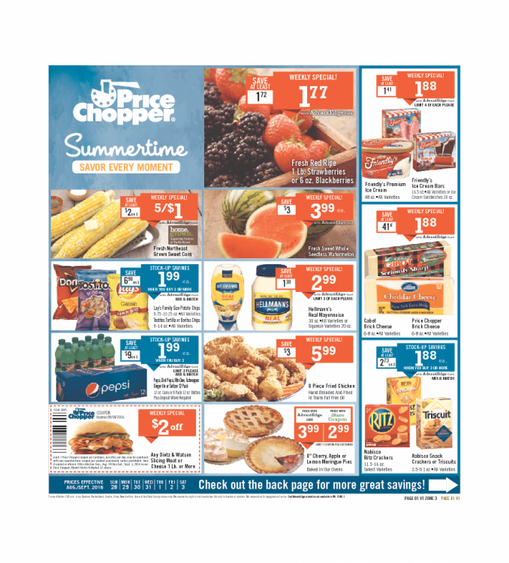 Price Chopper Ad Utica Ny this Sunday 28-8-2016 presents: fresh northeast grown sweet corn, lays family size potato chips, fresh red ripe strawberries or blackberries, fresh sweet whole seedless watermelon, hallmanns real matonnaise, 8 pieces fried chicken, 8 cherry apple or lemon meringue pies, pepsi products, any dietz & watson slicing meat or cheese or more, friendlys ice cream bars, cabot brick cheese, perdue frozen bagged breaded chicken, cooked perfect angus beef meatballs, sandwich steaks, butchers promise angus beef bone in ribeye steak, price chopper meatloaf or meatball mix, certified angus beef boneless chuck steak orroasr, chiappetti grass fed beef ground taco meat or chorizo, certified angus beef shoulder london broil, chiappeti fresh ground veal or lamp, split grilling chicken, boneless center cut pork chops, fresh pork tenderloin hatfield marinated tenderloins, assorted pork chops, 94% lean ground turkey, johnsonville orginal bratwurst or italian sausage. Alsoyou get at Price Chopper Supermarket: fresh organic california red or green seedless grapes, freesh organic bartlett pears, fresh organicmini peeled carrots, organic sweet potatoes, fresh sweet peaches, fresh raspberries or blueberries, fresh price chopper apple cider, fresh california red or black plums, fresh sweet cut watermelon, fresh naked juice. See more by visit the site: Supermarket Weekly Ads.